Believing in a witch’s prophecy that he will die at the hands of the king’s first born, a wicked priest, Maax (Rip Torn), sends a minion to steal the unborn child. A peasant saves the infant from being sacrificed and raises him as his own. Years later, the boy has become a man, Dar (Marc Singer), living in a small village that is besieged by Maax and his villainous horde. During the attack, an unconscious Dar is pulled to safety by his steadfast canine. Upon awakening, the man sees that he is the only remaining member of his tribe, and he swears vengeance against Maax and his venomous rein. While still very young, Dar learns that he has an ability to commune with beasts. It’s a mental and physical connection, as Dar says that the animals can comprehend both his thoughts and his feelings. On his road to retribution, Dar befriends a falcon, Sharak, a black tiger, Ruh, and two ferrets, Kodo and Podo. The man eventually encounters Kiri (Tanya Roberts), who tells him that she is a slave. When learning that Kiri is to be one of Maax’ sacrifices, Dar makes it his purpose to save her. He receives an ally in Seth (John Amos), a warrior protecting the king’s son, Tal (Josh Milrad). They seek to rescue Kiri, who is Tal’s cousin, and free the imprisoned king and the people from under the control of Maax. The Beastmaster (1982) was co-written and directed by Don Coscarelli, who also helmed the iconic horror feature Phantasm (1979), as well as its sequels, and the cult favorite, Bubba Ho-Tep (2003). Coscarelli specializes in delightfully absurd plots: Phantasm concerns an otherworldly mortician changing corpses into dwarf-sized creatures to do his bidding, and Bubba Ho-Tep is about a still-living Elvis Presley battling a mummy. Though The Beastmaster belongs to a more clearly defined genre, it is still vintage Coscarelli, as Dar confronts witches with repulsive, deformed faces and the bodies of young women, bird-like beings that wrap their wings around their prey and leave behind nothing but bones, and men turned into mindless brutes adorned in spiked metal armor. Though it’s easy to sympathize with a man forced to battle seemingly unbeatable odds, Dar is an engaging character. His bond with animals is perhaps his most appealing quality. He earns the respect of wild beasts, so that the villains are identified not necessarily by malicious acts but by antagonizing Dar. Viewers may tend to disregard humans who neither believe in nor agree with the beastmaster. Dar is muscular and athletic, but he is not bodybuilder-sized like Schwarzenegger’s Conan, so he has the appearance of an everyday man, an idea reinforced by the unassuming performance from Singer. Dar does not simply swing a heavy sword. He climbs and kicks, utilizing movements that flow and help make the character more natural. This is aided by the fact that Singer has studied kung fu. Dar spends the better part of the film as an outcast. Stolen from his mother’s womb and his tribe destroyed, he is even pushed away by the people he is helping, being called a “freak” by the marred king (who, unbeknownst to anyone at the time, is Dar’s father). The beasts are his family, as Dar allocates their skills: Sharak is his eyes, Ruh his strength, and the ferrets his cunning. But the capabilities of each are apparently limitless, as Dar’s survival is predicated on their very existence. As a viewer, it is preferable for Dar to have the unconditional support of the always reliable animals, as his human companions are burdened by the all-too-human faults of betrayal and self-preservation. Like other Coscarelli films, The Beastmaster ultimately garnered a loyal following, and sequels were invariably produced. The first was Beastmaster 2: Through the Portal of Time (1991), a mildly interesting misfire that took Dar to modern day, followed by the equally uninspired made-for-TV Beastmaster III: The Eye of Braxus (1996). Singer returned for both films, but Coscarelli handled neither sequel. Sylvio Tabet produced all three films, directed the first sequel, and created a Canadian TV series, BeastMaster, in 1999, which lasted three seasons. Though Dar was portrayed in the series by actor Daniel Goddard, Singer did appear in the third season as Dartanus. The Beastmaster was loosely based on the 1959 novel, The Beast Master, by sci-fi author Andre Norton (one of the pen names of Alice Mary Norton). Although Norton received no credit for the 1982 Coscarelli film, she is credited in the series. The year after The Beastmaster, Marc Singer would star in the very popular mini-series, V, about a stealthy invasion by reptilian aliens, which was followed by a second mini-series, V: The Final Battle, and a short-lived regular series, V: The Series. More recently, Singer will be making an appearance in the second season of the currently running V, a remake of the original mini-series. Coscarelli’s film is one of the more memorable sword-and-sorcery movies. The director retains a frantic pace, pitting Dar against extraordinary obstacles. But in a world filled with beasts, the most deadly and evil -- the witches, the winged creatures, the army of faceless soldiers -- encompass a monstrosity derived from their humanlike features. The animals, on the other hand, are kindred spirits, and Dar, who places his faith and safety in them, is the unwavering hero. I liked Beastmaster a lot, Sark, partly aided by my two boys who were 5 and 8 and insisted I watch it. They LOVED it. 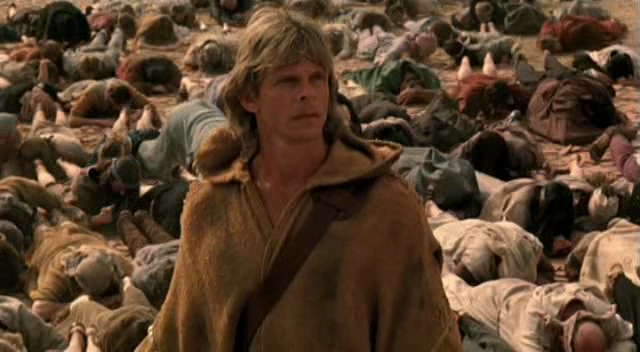 Marc Singer is not usually someone I feel is a good actor, but he did a great job in Beastmaster. I'm goign to haev to get the boys over (who are now in their 30's!) and have a Beastmaster movie night for old times sake! Very good review, Sark. Boy am I butterfingers this morning -- it's GOING, not goign, and HAVE, not haev! I remember sometime in the 1980s Dennis Miller said HBO stood for "Hey Beastmaster's On" due to its seemingly every other day run on the new network. I like this one too, though it does go on a bit too long. Great Lee Holdridge score too. I love this film, Sark. It is no great movie but a very enjoyable one. I used to watch it everytime it came on TV. I always thought the scene where the bird creatures (for lack of a better word for them) save Dar's life. It chilled me when they folded their wings and melted the beings. I have always liked Singer. He is pleasing in all his films. V is my favorite TV mini series. You could have included better photos of Marc in his warrior outfit though. He looks so hot in it!! I agree with Kevin about Holdridge's score. It is a great one and on my iPod. I listened to it this morning before checking out the cafe. A nice review that included interesting facts about the movie. Enjoyed reading it!! 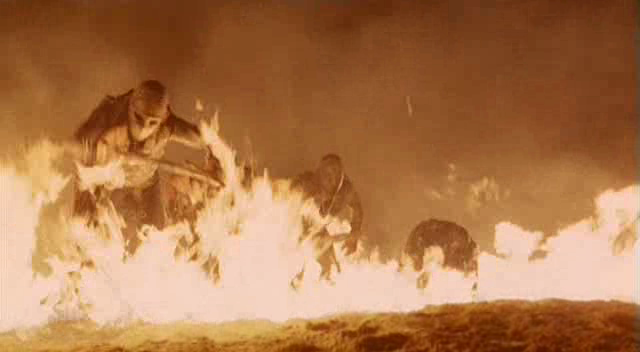 Hey sark, Beastmaster was shot in the wilds of Simi Valley (sort of a joke among SoCal locals). And in certain tight close-ups you can actually see Marc's contact lenses! Which started a popular drinking game while watching the movie - take a drink every time you spot Marc's contacts! And Becks, I think Aki gave us the reason why you really watch this movie....Singer in his "hot warrior outfit", LOL? Paul, I refuse to answer on the grounds that it may say too much about me!! Sark, this was a fabulous review of my favorite sword-and-sorcery film of the 1980s. Coscarelli knows how to make entertaining movies--I'm a fan of PHANTASM AND BUBBA HO-TEP as well. Singer is likable as the hero (typically, I'm not one of his fans). As for the beefcake comments made by my fellow Cafe readers, all I can say is that Tanya Roberts provides an equal dose of cheesecake (especially for a PG-13 film). In hindsight, this was probably Tanya's best performance in a film (well, compare it to SHEENA or A VIEW TO A KILL). Coscarelli has great fun with the man-communicating-with-animals premise. I love your post title and contention that the humans are the beast, especially when compared to Dar's loyal, courageous animal friends. You've added some depth to a movie designed just to be fun. That's pretty cool. Sorry, Rick, but there is no way Tanya looks as good as Marc in his hot warrior outfit. 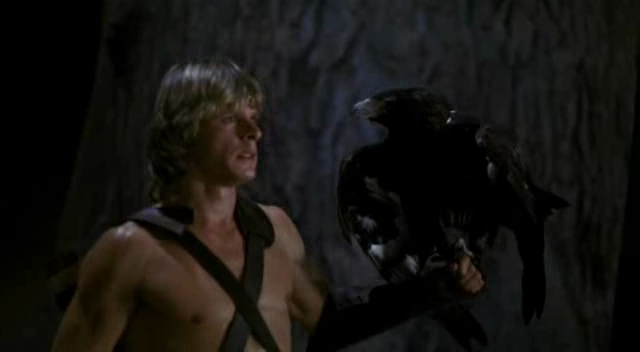 Marc Singer in The Beastmaster is awesome!! I wouldn't mind having a huge poster of this movie. I am not certain but I speculate that this is the "cakiest" blog we have ever had at the Cafe! And, Paul, your post was really funny! I love movies where the protagonist cares for animals so "Beastmaster" appeals to me on that level, too. Great review, Sark! I think I may need to revisit "Beastmaster" again. Sark, I am ashamed to admit this, but I have seen this several times...mostly because it came out when I was still a child and my brother's and I thought it was totally "rad". Loved your review.